We are a non-profit theater performance group whose members are residents of The Villages, Florida, the largest retirement community in the United States. We are an inclusive theater organization welcoming all levels of talent. We provide opportunities for all to participate and perform. We emphasize having fun at all our rehearsals. All are welcome; all are part of every show. We do not use guest performers or special groups. Any Villages resident may join our group. Dues are $10 annually, renewed in January or provided at audition. Only members may audition for shows. All who audition will have a part in our shows. We want backstage, stage crew and other kinds of help. Come visit one of our rehearsals! Proceeds from all of our shows benefit local charities. Organizations desiring our support may contact us at starlightplayers@gmail.com. 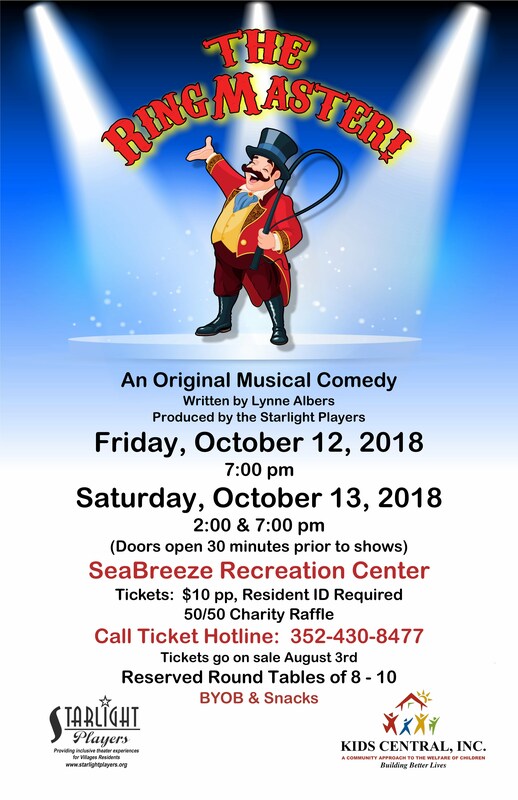 Reserved tickets are sold through the membership or at any Friday morning rehearsal at Seabreeze Recreation Center from 9:00 am until nearly noon. You can also call the ticket number: 352-430-8477. Tickets are always only $10. Reserved seating at tables of 8, or individual seating as requested. BYOB and snacks. Tickets are sold at the door on the night of the show if available. We generaly sell out for all performances. our show director sets the schedule. Check website calendar for changes. Meets regularly throughout the year for planning and development of upcoming shows. When auditioning for a show, we ask that your choose from a suggested list. Please bring your CD in your key, unless otherwise noted. We expect you to have a copy of the lyrics if we do not have a "karaoke" version of your selection on hand. Once selected for a musical number, you must submit your selection/s via mp3 files in your key to our sound technician. You must learn the lyrics to your song. A customized hour of music, singing, & comedy, as well as encore presentations from our previous shows, on request. We provide our own sound equipment. A small donation to our club is appreciated but not necessary.